THE A-LIST: Grange, IRAWMA founder Ephraim Martin, and special honoree Joe Bogdanovich at the recent launch. 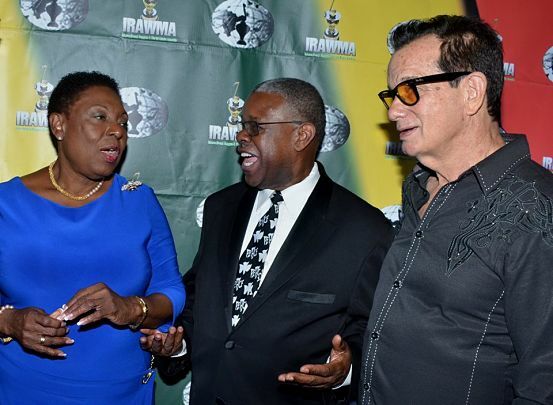 THE International Reggae and World Music Awards (IRAWMA), last staged in Jamaica in 2002, is returning to city Kingston for its 37th anniversary staging on May 11. The occasion is momentous for at least two reasons, as it coincides with the 50th anniversary of reggae’s emergence as a musical genre, and May 11 commemorates the date of Bob Marley’s passing. “It’s a fitting tribute to the memory of the legend. Bob Marley wanted to die on Jamaican soil because if he died while travelling it would have meant something to him,” Culture minister Olivia ‘Babsy’ Grange said, delivering the keynote address at last Tuesday’s media launch at the hosting venue, the Jamaica Pegasus Hotel. This year, the organizers have chosen to recognize some 161 nominees in 41 categories, with nine special awards also to be handed out. Shaggy (5), Sean Paul (4) and Koffee (4) have the most individual nominations. Lifetime Achievement Award honorees Tony Rebel, Boris Gardner and Mutabaruka will also be inducted into the IRAWMA Hall of Fame. Joe Bogdanovich (Entrepreneur Award), Beres Hammond (Reggae/Lover’s Rock Legend Award) and Grange (2018’s Person of the Year) are among the other special honorees. Busy Signal, Chronixx, Damian Marley, Popcaan and Shaggy are vying for the coveted Bob Marley Award for Entertainer of the Year. >> Log on to irawma.com to see the complete list of nominees and to cast your vote. Public voting closes on April 20.